But I just flagged the question once, and accordingly I still have 9 flags available to be raised today. Is there a bug somewhere with the flagging system? 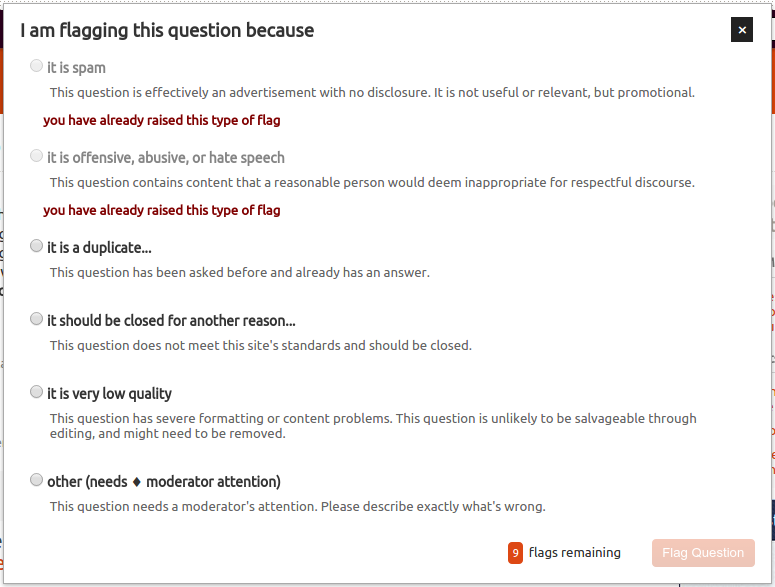 How does the Spam flag differ from the Offensive flag? In terms of getting the post deleted, there is no functional difference aside from separate counts - 3/6 of either will be sufficient to delete. Spam flags provide data for spam-filtering, and offensive flags similarly provide data for anti-trolling measures. Not the answer you're looking for? Browse other questions tagged bug status-bydesign flagging .